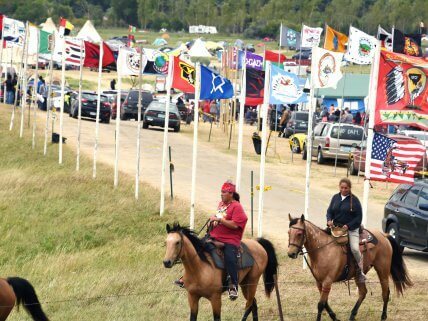 Flags of American Indian tribes line the entrance to an encampment near Cannon Ball, North Dakota, site of protests against the Dakota Access Pipeline, September 2016. After months of protests, the Dakota Access Pipeline (DAPL) has received the go-ahead from the U.S. Army Corps of Engineers. The oil pipeline project near the Standing Rock Indian Reservation has been surrounded by controversy as Native American activists and environmentalists have sought to prevent its completion. The 1,200-mile pipeline is being built to carry oil from the Bakken shale oil fields of North Dakota through South Dakota and Iowa to Patoka, Illinois, where it will connect to other pipelines. The route of the underground pipeline crosses beneath Lake Oahe and the Missouri River near the reservation. The Obama administration had delayed the granting of an easement through federally owned land that was required for construction to proceed. President Trump directed the Army Corps to take steps to permit the pipeline to be finished. The Standing Rock reservation in central South Dakota and North Dakota was originally part of the Great Sioux Reservation created by the Treaty of Fort Laramie in 1868. It is home to around 10,000 Lakota and Dakota Sioux, known collectively as the Standing Rock Sioux Tribe. The Standing Rock Sioux have opposed the pipeline’s construction from the start, and their legal challenges are ongoing. They warned that construction—or a potential oil spill—could damage the water supply on which the tribe depends. They also alleged that federal laws and treaties were violated in the permitting of the project, and that the pipeline’s environmental impact was not fully assessed. Over the last year, members of other Native American tribes came from around the country and from Canada to Standing Rock. American Indian activists were joined by environmentalists who oppose the use of fossil fuels. The protesters, who encamped in tipis and tents mostly near Cannon Ball, North Dakota, numbered in the thousands. In one clash, private security guards for the construction company used attack dogs, pepper spray, and other riot-control tactics against the protesters. Many were injured and more than two dozen hospitalized. Since the protests began, nearly 500 protesters have been arrested. Eventually the leader of the Standing Rock Sioux Tribe asked demonstrators to leave the camps but to continue working for the cause locally and nationally. This article presents an overview of the pipeline project and the protests. This website tracks the legal challenges to the pipeline by the Standing Rock Tribe and its allies. This site approaches the controversy by presenting both sides. This site presents the pipeline company’s side of the story; includes maps, a factsheet, answers to “misconceptions,” and links to additional stories. Learn the history of the Standing Rock Indian Reservation.